March 18, 2015 By Elizabeth Lindemann 7 Comments / This post may contain affiliate links. I might just be a little bit obsessed with the Caprese combination of fresh mozzarella, tomato, and basil. At our house, we go through a block of fresh mozzarella at least once every two weeks. I’ve used this combo in a Spicy Caprese Salad, a Roasted Tomato and Burrata Caprese Salad, and on a Caprese Pizza. 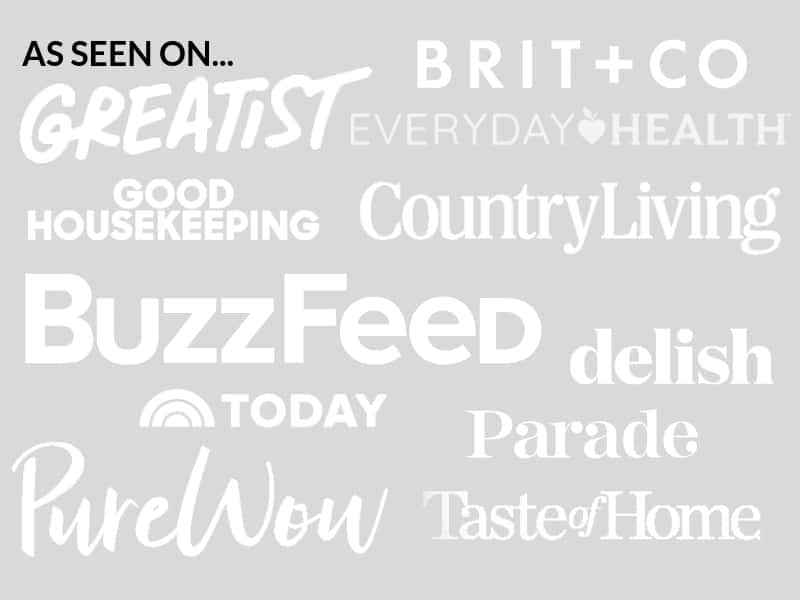 And that’s just the recipes that are on this blog! See? Obsessed. Now, I have journeyed down the Caprese sandwich road, never to return again. I am hooked. 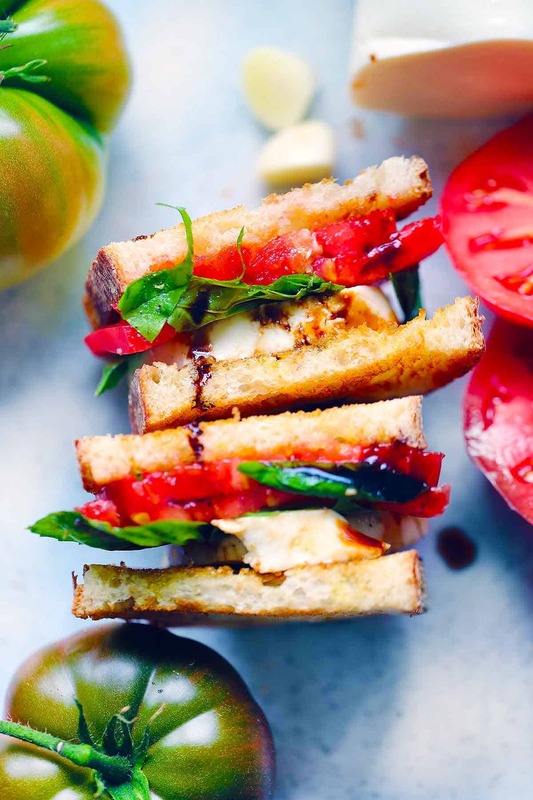 These fresh mozzarella, tomato, and basil sandwiches with balsamic glaze are the perfect light and healthy vegetarian lunch. They’re sure to give you a big boost of happiness in the middle of the day! 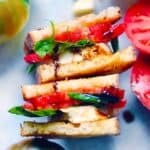 I’m going to go ahead and say it: this is my all-time favorite vegetarian sandwich. Ever. And if you know me, you know I don’t like playing favorites with my food! Just please, don’t tell the dill egg salad I said this. First, let me tell you a little bit about balsamic glaze. Ohhhhhh, balsamic glaze. I saw you in the aisles of Trader Joe’s and from the moment I laid my eyes on you in the middle of choosing the perfect pasta shape, I knew ours would be a love to last a lifetime. You are tangy. You are sweet. You are thick and rich and full of flavor. You complete me (well, you at least complete this sandwich!). And the best part about it? It’s naturally sweet from the concentration of balsamic vinegar, not from added sugar. Try it in salad dressings, drizzled on strawberries, or even on ice cream! Now, back to the sandwiches. First, toast some bread. Drizzle one piece with some of the liquid gold that is balsamic glaze. Top with sliced fresh mozzarella, tomatoes, and fresh leaves of basil. Drizzle with some olive oil, a little more glaze, and season with salt and pepper. 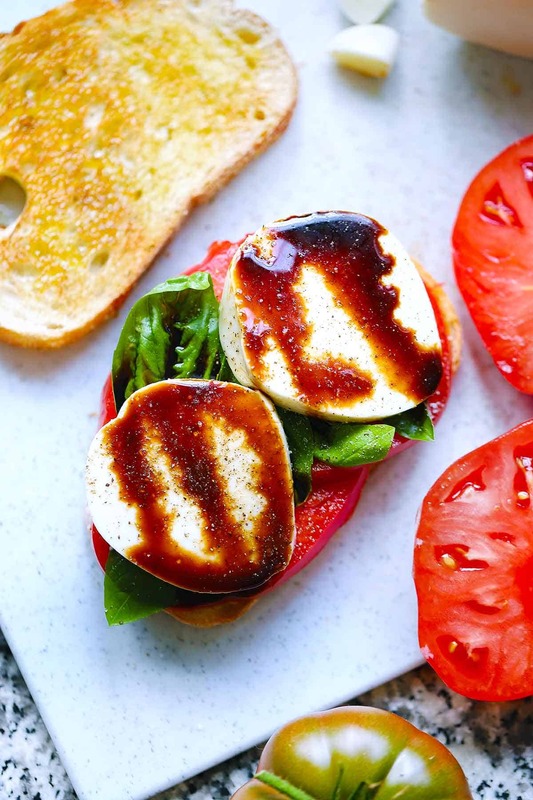 These Caprese sandwiches are my absolute favorite vegetarian sandwich, topped with EVOO and a sweet and tangy balsamic glaze. 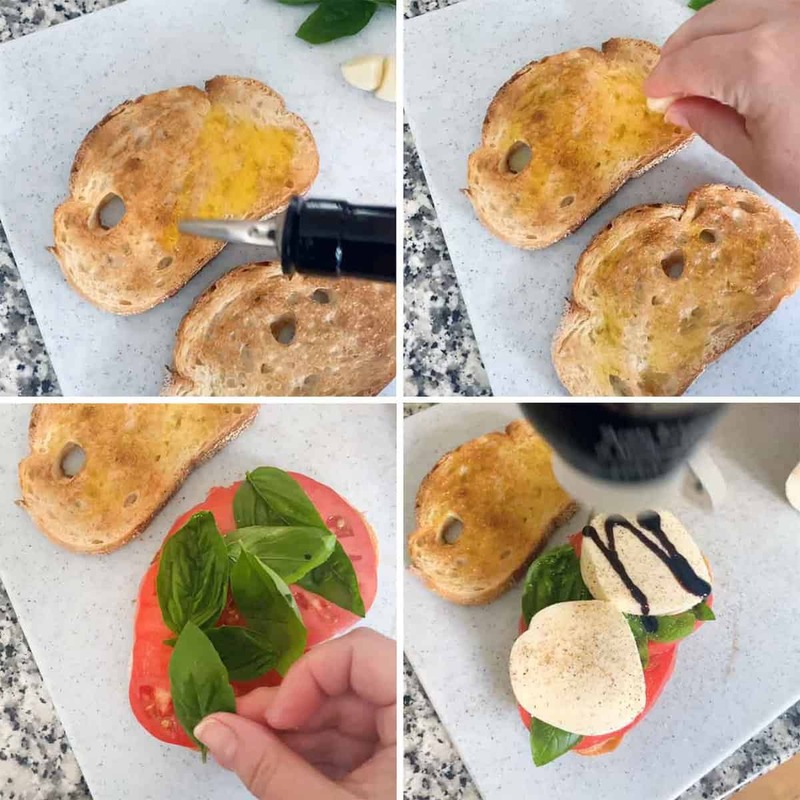 Drizzle half the balsamic glaze evenly on one slice of bread. Add the mozzarella, tomatoes, and basil. Drizzle with the olive oil, the rest of the glaze, and season with salt and pepper. Add second slice of bread and cut in half. I’m using this for a major prac in school, thanks so much! Hi Elizabeth! What would be the nutritional breakdown per serving? Thank you!